One thing I can always count on from Warren or Government Mule is each release is going to be different than the last one. This is the sign of a genuine accomplished musician. I have just about every Government Mule and Warren Haynes solo cd that's been released. I couldn't wait for Ashes & Dust to come out and purchased a deluxe cd from the website. I'm not a big fan of blue grass music, however, if every bluegrass band sounded like this, I'd become a regular listener. The cd is amazing. It's been in my automobile stereo for a month and a half and I listen to it every day. I was also amazed to hear a few blues tunes as well and can't wait for Warren or Government Mule to do a blues cd. I particularly enjoyed the various tracks with Warren playing solo and the same songs with the band. 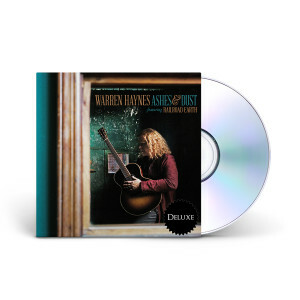 In addition to the deluxe cd set I bought from the website, I bought two copies at my local Barnes & Noble music section to send to two music loving cousins to introduce them to Warren. They also loved the cd. Do me a big favor, tell Warren, my wife and I loved him at his brother's city council benefit in Asheville. We live in Asheville and have attended several Christmas Jams, saw him twice in Raleigh and once in Atlanta. Looking forward to the next release. The unknown side of Warren. Ashes & Dust is simply amazing, it sorround me in an emotional twister. I cant stop playing. Thanks Warren. Awesome album. Warren is the man! Excellent album, it showcases once more the diversity of Waren Haynes, well produces and excellent musicians!! Great solo album, though having Railroad Earth backing Warren technically voids that thought. We love the sound and hope to hear it at Christmas Jam this year. If RRE is unavailable maybe the "local" guys in Steep Canyon Rangers would be willing to fit in! Can't stop listening to it and the 2 additional discs I got with it. All the highest quality and what I've come to enjoy from Warren Haynes. The "Americana" sound of it is very unique to all the other recording of Warren we have. Looking forward to seeing you and Mule and all your friends again this year! 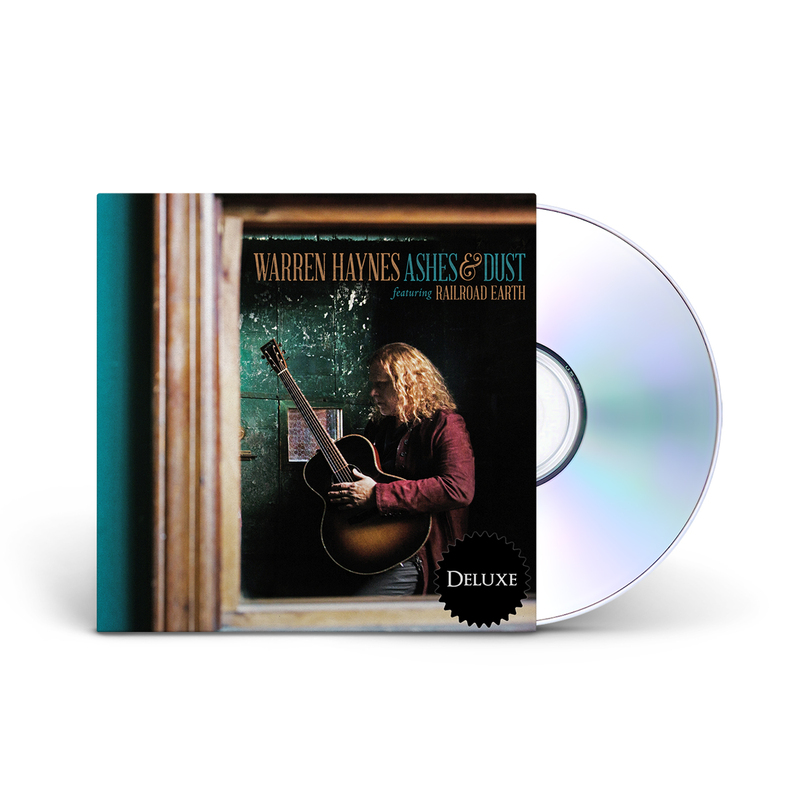 Another 5-star album from Warren. Love the blend of styles. Another great disc from Warren. His and the Mule releases are always different and wonderfully refreshing. There was a glitch in production which held delivery up but I took advantage of the download offer, great stuff! Well done guys roll on the next one! Brought a smile to my face and at times a tear to my eyes. The China Doll on the bonus CD was just awe inspiring. Thank you Warren! AFTER NUMEROUS CD SETS FROM WARREN, I JUST WOULD LIKE TO ADD, THAT I PERSONALLY BELIEVE THAT MR. HAYNES HAS FINALLY FOUND A MOST WELCOMED HOME. ASHES TO DUST, HIS LATEST RECORDED CD SET, WITH RARE EARTH, HAS ABSOLUTELY BROUGHT SOUNDS AND TONES THAT ONLY THIS GROUP COULD PROVIDE. BEING FROM N. CAROLINA, THE MIX OF COUNTRY ALONG WITH SOUTHERN ROCK HAS FINALLY JIVED TOGETHER. THIS BRAND NEW CD SET, IS BY FAR , THE TRUE FEELING OF MR. HAYNES. NOT ONLY IS THIS NEW RECORDING ADDICTING, BUT I JUST CAN'T SEEM TO HEAR IT ENOUGH. FROM SOLO ARTIST TO THE ALLMAN BROTHERS BAND, TO GOVERNMENT MULE, TO EVEN THE WARREN HAYNES BAND, WHICH RECORDED LIVE IN AUSTIN, TEXAS, WAS MOST OFTEN PLAYED IN MY STUDIO, THIS NEWLY BEST, CANNOT BE HEARD ENOUGH BY ME! WELCOME HOME, WARREN. Everything Warren has ever associated himself with has always been top quality and top service. Ever since the days of the beginning of the Mule Warren himself has made everything very personable and made time for his fans and went above and beyond to insure satisfaction. Oh that's a Great Album i like it very mutch it's good Musi with Railroad Earth toghter i know a lot of CD of RE! Every Guy in the World buy it and flow a way befor You do it have a kind of Smoke by the Way! Exceptional Music from an amazing player and band! Wonderful to hear the musical diversity of all the players and the soulfulness of Warren's Voice and playing!! Great album! A great mix of Warrens stellar first playing, classic lyrics, and the Railroad Earth ambience! Add this one to your collection.